Aside from buy ing farmland, investing in machinery is likely to be the most significant capital outlay facing family farms. Fortunately, tyre-kicking and negotiation on price come naturally to a lot of farmers, but when it comes to financing the purchase, how many businesses truly evaluate all their options? Sharing farm machinery is a solution being employed by some farms. Mr Gee says it will not suit everyone, but it is worth considering if farms want to get the benefits of having the newest machinery, but do not have sufficient acreage to justify the investment. While the number of people talking about machinery sharing far outweighs the number of businesses striking agreements, Mr Gee expects a partnership approach to become more common in future. He says: “I hear a lot of talk about sharing machinery, but it is not as common as you might think. Primarily because many farms do not want to lose total control of their operations and those who are like-minded are not geographically close enough to make it work. “Farming has traditionally been a very independent industry and has not had to resort to this approach, but I would expect it to become more common in future, particularly with the largest purchases, such as combines. Will sharing work for me? Personalities: You are going to need to go in to business with a person or people you can trust and rely on. Do they have a similar outlook to you, and can you work together with this person? If not, the agreement could be doomed from the start. Geography: Perhaps the most fundamental element to consider is whether you have neighbours within 10 miles or so who would be interested in working together. The alternative is long-distance travel, which can cost time and money, but can work in certain situations. Cropping and acreage: Are you growing a similar or complementary rotation to the person you want to share machinery with? Does your combined acreage and timing of main operations make the figures stack up? Figuring out how to make a farm business profitable and sustainable can be a challenge. But for farm manager Rob Fox, the decision was easy: team up with a group of local farmers and kick-start a new collaborative venture of machinery sharing. 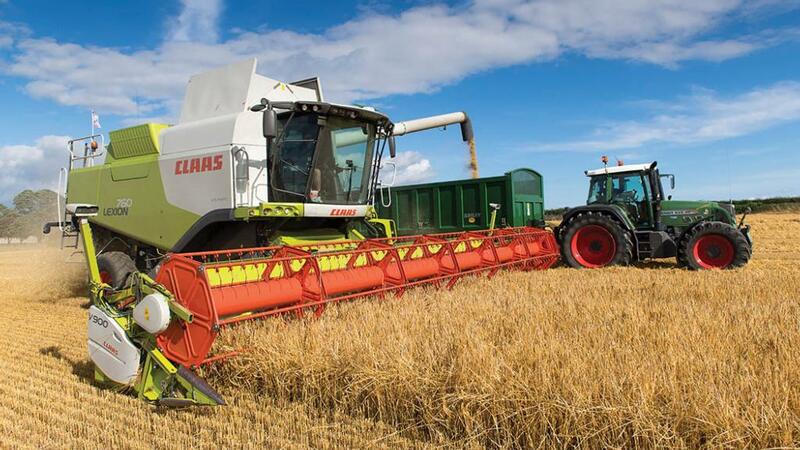 The extension of arable land has helped downscale a much larger collection of farm machinery to enable the farmers to operate a relatively thin machinery fleet over 728 hectares (1,800 acres). And in Mr Fox’s words, ‘size does not matter’. He took the idea from a similar experience with his family farm and has since branded it ‘the way forward’, no matter the acreage of the farms involved. He says: “Machinery expenses are consistently one of the highest spends on our balance sheet, so we have to find ways of getting spend down. “It just makes sense. We all own different pieces of machinery across the three farms to make sure we own everything we need between us to do our job across the whole acreage. Machinery sharing works across a fairly straightforward process, where Mr Fox timetables the equipment for use on each farm. When the time comes for a piece of kit to be replaced, each farmer voices their preference on what to buy next. But those involved in the system must be sensible about distance, be open-minded and keep up-to-date with communication, Mr Fox says, otherwise it will not work. He says despite minor challenges, such as having more people in the decision making process, machinery sharing is an enjoyable process which boosts farmer camaraderie. Who gets to use the combine on the one dry day in the middle of a wet harvest is an obvious question which will be raised by machinery sharing sceptics. One approach to negate the potential impact is to agree on which crops are to be prioritised. Agreeing to tackle milling wheat before feed wheat, for example, is a simple way of avoiding disputes and stress. Planning and agreeing a strategy before situations arise is the best approach. Some farms agree to share drying costs so no-one is penalised by being forced to harvest at higher moisture levels. Financial pressures outside of the share agreement can lead to one party not being able to meet their payments or provide capital to the partnership. Building a robust legal contract, which details how the agreement can be ended, is the best way to protect all parties. Machines break down, and huge, unforeseen repair bills can be an issue. Warranties, insurance and other contingency plans can be put in place to avoid exposure to these risks. The most common structure a sharing agreement will take is a partnership. There is no requirement for a partnership to publish a set of accounts and the tax conditions are different. Rob Selley, an associate at A.C. Mole and Sons, says partners are taxed on their individual share of profits, while a limited company is subject to corporation tax. A partnership tax return must be submitted each year, along with a self-assessment tax return. Professional advice is always important to consider each party’s circumstances and to select an appropriate vehicle for the agreement. Buy the machine outright using cash from the business. This means the farm does not owe anyone any money, but it requires a significant investment. The annual investment allowance can be used (currently £200,000) to reduce tax liability. In this scenario, a deposit is paid up-front, followed by regular payments for a set period of time. At the end of the agreement, you will own the machinery. This approach helps maintain cashflow and is often attractive during times of low interest rates. An operating lease agreement charges a rent to lease the asset. A farm will not own the machine at the end of the agreement and monthly payments can be quite high. Tax relief at 100 per cent can be claimed on payments. Carrying out simple maintenance on agricultural machinery and vehicles will not only reduce downtime, but also increase operational productivity. Being proactive and committing to a preventative maintenance routine can extend the life-cycle of a machine and improve farm safety. Most operators will undertake basic maintenance on tractors, such as regular oil changes and checking air-con units are gassed up. But how many miss a few other simple, but equally important, checks? Are lights and flashing beacons in good working order and secure? Have tyres been checked for punctures? Are windows clean and latches in good working order? Are steering rams and back-end hydraulics working correctly? Are there any oil leaks around seals and pipe fittings? Are door fastenings and hinges working correctly? Is the seat comfortable and securely fixed? Lights, tyres, tailgate latches and hydraulics should also be routinely checked on trailers. Loaders must be certified for Provision and Use of Work Equipment Regulations and Lifting Operations and Lifting Equipment Regulations as a legal requirement for the Health and Safety Executive. Inspections undertaken by qualified inspection engineers will not only identify any performance compromising issues and satisfy safety requirements, but also provide each machine with a comprehensive service history. Engineering certificates prove a machine has been well maintained and is in good, safe working order in the event of any later sale. Should a machine be stolen or involved in an accident, reports provide evidence as to its condition, operating hours and advisory issues which have been acted upon, and will help establish its true value.